As someone who is not a citizen of Scotland, no one should care what I think about their upcoming referendum. Honestly, that is not a facetious statement, self-determination and the right to peacefully secede is a cornerstone of what it means to be part of a democratic state, so no one outside the country should be lecturing them about consequences or trying to influence them either way. So while I do have a number of (probably poorly assembled) thoughts on the situation, I will not burden anyone outside of direct earshot with them. I would simply like to wish Scotland all the best, and instead write about something a little bit closer to home. 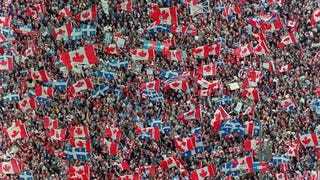 On the eve of what is potentially the most important day in modern Scottish history, I thought I would reflect on my recollection of the the 1995 Quebec referendum. I was in grade one when the people of Quebec went to the polls for a second time to decide on the future of their province, and of Canada as a whole. I do not remember much from this time, national politics are about as far removed from the interest of your average primary school student as anything you can think of. But despite that, it was impossible to escape the general buzz that filled the country. I know this not just from reading history, but because two memories relating to the referendum stick clearly in my mind almost two decades later. In retrospect this makes sense, the repercussions of the sovereignty debate reverberate strongly through Canadian politics to this day. The rise of the Manning's Reform Party which later gave birth to Harper's Conservatives, Chretien's scandal which tarnished the Liberal brand in the minds of a generation of voters, the rise and fall and then obliteration of the Bloc Quebecois, Jack Layton's Orange Wave; all of these can be traced back at least in part to Quebec's push for independence, which came to a head on October 30, 1995. But six-year-old me did not appreciate any of this. All I knew was that something momentous was underway. My first grade teacher, who I adored, was from Quebec. Even on the West Coast this was not unusual, being a French Immersion program about two thirds of the teachers were either from Quebec or had Quebecois heritage (the remainder were either French French from France, learned french as a second language, or taught English class). I have not the slightest clue what her feelings on the referendum were. Even if we were old enough to understand what that meant I doubt she would have wanted to discuss politics with her young pupils, that is a recipe for stories being told to parents later over dinner and then angry calls down to the school. But she did comment on the issue by way of Halloween costume, dressing up as a referendum. I did not get the pun at first, nor did the rest of my classmates, and I think I only loosely grasped it even when laid out to me. But I can still recall the image of my teacher standing in front of the class, blond curly hair spilling from underneath a black hockey helmet, wearing a referee's uniform with OUI/NON stenciled on the back. My parents, like most of English Canada, were backing the No side. The belief that Quebec should remain a part of Canada is near-ubiquitous among non-Quebeckers. Little me, six years old, asked my mom why this was. Why should we, who lived thousands of kilometres away from the Canadiens and the Nordiques and the St Lawrence and the Bonhomme Carnaval, be so invested in the vote I wondered. I do not recall how exactly I phrased my inquiry. I doubt it was anything eloquent, for all I know it was the simple "but whyyy?" of a child seeking attention. Nor do I know why my mother answered the way she did. Maybe it was just the only thing she thought someone my age would understand. Maybe it was just the first thing that came to her mind. Maybe she thought it was a funny way to boil it down and, tired after a long day of dealing with young children, was just joking around. But the answer she gave is somehow one of those indelible memories from childhood. My mom told me that if Quebec separated it would cost more to mail letters to my great aunt in Montreal. That must have seemed like a very good reason to first-grade-me, as I do not recall anything else on the subject. Years later this idea still brings a smile to my politics-obsessed face, not only because it is a ridiculously reductionist way to look at a complex issue, but because in some ways my mother had summed up the Quebec Sovereignty debate from an outsiders perspective absolutely perfectly, whether she intended to do so or not. Most Canadians have strong feelings about Quebec being a part of their country, that the shared history of Confederation and a love of hockey inextricably binds Quebec to Canada. But if put on the spot, I would wager most of us would struggle to explain one way La Belle Province leaving would affect them on a day to day basis. These two memories are what is left, almost twenty years later, from how a six year old views a crisis of national unity. The fact that I recall anything at all is really the shocking part, I do not think I could name another memory of a current event or news story from that period. I remember family and friends and vacations and sports, but certainly not elections or natural disasters or wars in far away countries. It seems rather trite to make some comparison between the national psyche and the psyche of a six year old child, but there is a grain of truth there. If the referendum left such an impression on me, at an age when I remember almost nothing else, the impact on Canada cannot really be understated. I am sure that somewhere in London or Liverpool or Birmingham there is a six year old kid, who thinks that soccer is the most important thing in the world, just like I felt about hockey, and like me 19 years ago cannot help to absorb the sense that important things are afoot. Kids have a radar for when adults are concerned about something, but you never really know what bizarre moments will be emblazoned into their memories for years and years to come.